MANILA, Philippines - Korean boy band Super Junior made history anew by topping a music chart in Taiwan for 100 consecutive weeks, a spot they’ve been holding on to since 2010. The boys' two albums, "Mr. Simple" and "Bonamana," have topped the chart on Taiwan's KKBOX, which bills itself as the "world's largest Chinese online music service." "Mr. Simple," Super Junior's fifth studio album, has grabbed the No. 1 spot on KKBOX's Korean album chart for 37 consecutive weeks since August 2011. Prior to this, "Bonamana," the title track of the boy band's fourth studio album, topped KKBOX for 63 consecutive weeks from June 2010 to August 2011. "We are very honored and grateful for being at No.1 for 100 weeks," Super Junior said. For their feat, Super Junior was awarded as the Korean Singer of the Year in the KKBOX Digital Music Award held last January. "Mr. Simple" is Super Junior's bestselling album of all time, with 500,000 copies sold since its release last August 2011. The album won the disk daesang award at the 26th Golden Disk Awards and 21st Seoul Music Awards. It also became No. 1 in the Philippines. On the other hand, "Bonamana," released in May 2010, sold about 300,000 copies. In the latest Korean album ranking on KKBOX, Super Junior is No. 1, followed by Big Bang's "Alive," KARA's "Hits," Big Bang "4.5 Special Edition," FT Island's "Grown Up," Girls Generation's "The Boys," Hyuna and Hyunseung's "Trouble Maker," 2NE1's "2nd Mini Album," Girls Generation's "Run Devil Run," and miss A's "Touch." 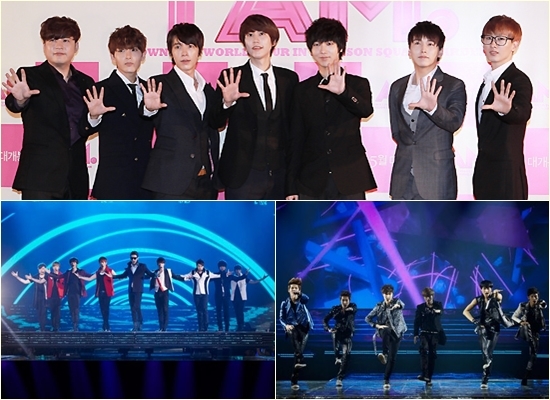 Last April 27 to 29, Super Junior held their "Super Show 4" world tour in Jakarta, Indonesia, attracting about 25,000 fans. This was the boy band's first solo concert in Indonesia, which also featured new boy band EXO-M as special guest. Super Junior will be holding their "Super Show 4" concert in Tokyo, Japan on May 12 and 13 followed by encore concerts in Seoul on May 26 and 27.